- The orphanage is being built. 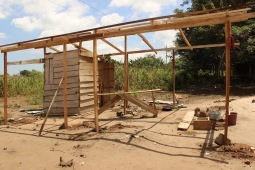 With funding from Swedish contributors, we were able to buy land and start building a safe home for the children at Tina’s Childcare in fall 2014. The building consists of five dormitories, a dining room and a family room. We moved in 1 november 2014. - Health insurance. The children get access to healthcare and medicines. - Kitchen building. When the food is cooked over an open fire outdoors, rain and wind contribute great stress. 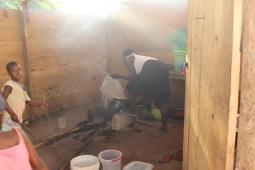 By building a kitchen building, our cooks can cook independent of weather. - Poultery farm. 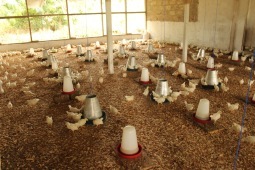 Between 2015 and 2017, we had a poultery farm with 1,000 chickens. The eggs gave the children important protein and the excess was sold in the local market. Unfortunately, in the long run, it became an expensive activity because of high veterinary costs. 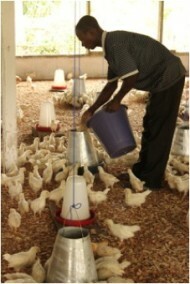 It did not generate the amount of eggs we expected and therefore the chicken farm was finally closed. - Farm land. Around the orphanage we bought land where we grow many of the crops that form the basis of the food at the orphanage. This gives us the opportunity to ensure that the children receive the varied diet they need. - School building. Since the youngest children were attending school at home in the orphanage and we were getting requests from the surroding villages to accept daystudents in the school, more space was required. To meet this need we built a separate school building contaning two classrooms. - Renovation of the orphanage. With many children in the house, regular renovation is required. In the spring of 2017, the orphanage was painted, parts of the inner ceiling were replaced, the glass blinds replaced with shutters and the beds that had become a little rickety got new life again. - Drainage channels around the building. Due to the erosion, the orphanage is very exposed to the large water masses that press on. The house facade and the foundation must endure much. Through drainage channels around the building, the water is collected and transported past the house, which is important for the safety. - Outside light. We installed big outside light since it gets pitch-black when the sun sets at around 7 o'clock. We did this so the childen would feel safe, to prevent burglary and keep animals away at night. - Schoolbulding. 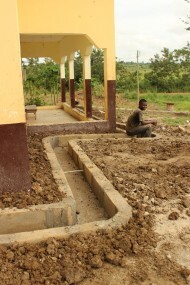 Thanks to donations of volonteers we where able to build 4 more classrooms. We rebuild the old poultery farm into classrooms. And Tinas childcare Academy was started. Now with classes from crech (1-2 year old children) up to grade 3. - Schoolbus. Since we built the new classrooms more students has come to the school and since it is preschool they are all small children. 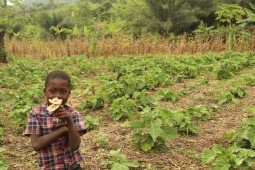 Many days the parents don't have the time to bring them to school since they have to go early to farm. Resulting in poor attendance and the children fall behind in school. We invested in a schoolbus to be able to help the children come to school every day in a safe way. The bus also gave us the opportunity to help more children staying a bit further from the school. - Water purifing system. A waterpurifing system was installed. 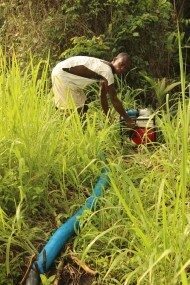 The water from de borehole, made when we build the orphanage, was unfortunately to bad to use. We instead hade to buy water every month to be able to give the children clean water. A big cost for us. When we got the funding to install the water purifying system it was a big relief. We are now cleaning the water from the borehole and the children have the cleanest water they can get and it is free! - Gas for cooking. To cook over open fire is a serious healtrisk. It is more expensive with gas than firewood but when it comes to the health of our mothers and chilren their is no hesitation. The mother where very happy and relived when we told them. -New bedroom. Since the number of children has incresed since we built the orphanage we decide to make a new bedroom for the oldest boys. We decided to use a part of the dininghall for that purpose. We also made new beds, fixed the electricity so the could have light and a fan and secured the windows with mosquitonet. New toilets for Tinas Childcare Academy. With the incresing number of students coming to the school the pressure on the orphanage toilets is to high so we built 4 toilets and 2 urinals to be used by the schoolchildren.